Pet parents postpone vet visits for all manner of reasons. Some fear what the veterinarian will find during the examination, while others worry about the costs. Regardless of the reasons for not keeping an appointment, the advantages of regular check-ups simply cannot be understated … especially if you’ve been noticing something different about your pet kid. Has your dog’s weight ballooned over the past year? Or perhaps you’ve noticed that your cat drinks more water than is typical … not only that, she’s actually lost weight. Or, there are no kitty symptoms aside from non-stop meowing at night. What many don’t realize is that unexpected changes in weight and eating or drinking habits are all signs to keep that appointment with your veterinarian. These are some of the common signs of feline and canine hormonal abnormality. Just like humans, our pets’ health and well-being are governed by their endocrine system, a complex collection of glands and chemical messengers that control everything from hair growth to metabolism. Also just like people, pets can experience hormonal issues that may lead to more significant problems. So what are the top signs that your pet might be suffering from a hormonal problem? Your pet’s lustrous hair is getting thin. For dogs, this is especially true for the trunk and tail. For cats, you’ll notice it first on the tips of their ears. Hair loss can be a sign of abnormal thyroid levels, either low or high, or even an early indicator of Cushing’s Syndrome. We’ll talk more about this disease in a moment, which results from abnormally high levels of cortisol, a hormone secreted by the adrenal gland. Stubborn fat that can’t be shed even with a strict diet. Unfortunately, this too could be a sign of Cushing’s Syndrome or hypothyroidism. Companion animals with Cushing’s also can have a pot belly despite being very active, whereas pet kids with low thyroid function tend to be sluggish and seem exhausted. It’s alarming when your pet kid eats with a voracious appetite, but is still losing weight. This could be a sign of abnormally high thyroid levels (usually in cats) or diabetes mellitus in either species. As you might imagine, increased thirst and urination can be a sign of kidney problems. But it can also be a sign of several hormonal disorders, including hyperthyroidism, Cushing’s Syndrome and diabetes mellitus. All of these are signs that something might be awry, and your dog or cat needs a full checkup right away. Your veterinarian will ask you some questions, examine your pet and usually recommend lab work. Most hormonal conditions are easily diagnosed with blood work or urine analysis, and fortunately, most conditions can be controlled with supplements or medication. As with most diseases, early detection is essential to successful treatment or control of the problem. Now that we’ve covered what symptoms you need to be aware of, let’s take a closer look at some of the most common hormonal conditions in dogs and cats. Hypothyroidism is much more common in dogs than cats. It is caused by an underactive thyroid gland, and symptoms include low energy, weight gain, hair loss, even neurological dysfunction. It is treated with a thyroid supplement and therapy is a life-long commitment. Equally common in dogs and cats, Cushing’s Syndrome is due to an overactive adrenal gland secreting too much cortisol. Common signs include increased drinking, excess urination, increased appetite, weight gain and hair loss. Cushing’s is diagnosed with blood work and sometimes abdominal ultrasound. Treatment is achieved with a medication that is used to decrease cortisol secretion or surgery to remove a tumor on the adrenal gland. Hyperthyroidism is seen primarily in cats, and is due to an overactive thyroid. Signs include increased appetite, weight loss, increased thirst and urination, hair loss and agitation. The condition can be treated with a medication to decrease thyroid hormone, surgery to remove a thyroid tumor, or possibly radioactive iodine. Diabetes is caused by decreased insulin or insulin resistance (Type 2, primarily due to obesity) which leads to increased blood sugar levels. Signs include weight loss, increased appetite, increased thirst and urination. This is a serious condition if it remains untreated … severe cases can lead to coma or even death. Treatment is with insulin injections and supervised weight loss. In many respects, Addison’s is the opposite of Cushing’s. It’s caused by an underactive adrenal gland. The symptoms are usually severe, include vomiting, diarrhea, lethargy and possibly even coma. Addison’s is diagnosed with blood work and urine analysis, and the standard treatment is with hormone replacement therapy. These patients are often very dehydrated when they are first seen by veterinarians, which may necessitate hospitalization and intravenous fluids. 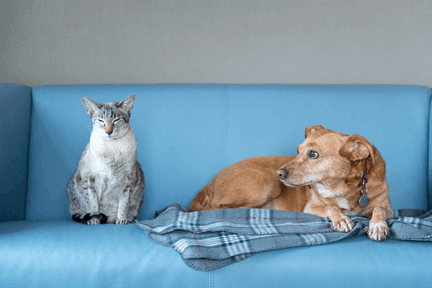 How can I prevent hormonal problems in my dog or cat? New research is actively being done to determine the causes of hormonal conditions in dogs and cats. One promising area of research is in the effects of early spay/neuter surgeries. Veterinarians are studying what changes these alterations have on the endocrine system of our companion animals. Always feed your dog or cat the robust nutrition offered by premium quality food. Pet parents should consider providing a food supplement to support health and overall well-being as well. Make sure your companion animal receives an annual veterinary exam. If your pet kid has achieved senior status, annual blood work and urine analysis play key roles in early detection, before medical issues become full-blown problems. Thank you for all you do to make the world a better place for companion animals. Foreclosure Crisis Leads to More Homeless Pets - The Dr Jane's HealthyPetNet Foundation to the Rescue! Thank you, Dr. Jane, for another informative article. I hear so frequently about conditions such as Addison's and Cushing's, but really didn't understand what they were. It's nice to have your holistic approach to prevention of these syndromes as well as the explanation and medical treatment. I would love to read more about the early spay/neuter studies as the results are published. Another excellent article. Having all of my pets on Life's Abundance is the best way to protect them against illness. As with any food though, I am careful not to overfeed as this can lead to diabetes in pets. The weight loss formula is excellent. Thank you for all that you do. Great article, great information. Thank you. Thank you. Great article....am passing it along! Time after time, I find information on the blog that is precisely what I need to share with someone I know who is facing exactly the problem you write about. Thanks so much! I have had a dog with Cushing's disease and one that with hypothyroidism. Neither dog lost their coat. I always felt the fact that they loved eating Life's Abundance foods and treats helped to keep them fighting the diseases while on medication and living to ages 14 and 13. Thank you!